Over the summer my parents decided to start anew and move to Texas while I was in Albany for summer orientation. Anyone that came into contact with me over the last couple of months can attest to the fact that I was not happy about this as I live and breath New England and some would even say- worship Massachusetts. My biggest problem with moving across the country to a state that is the same size of eastern Europe was the fact that I would not have a home to go back to. Yes, Albany is only 2 hours away from where I grew up and where all my childhood friends still live but I felt as if it would not be the same. I was worried that although my friends and town would be unchanged the fact that I could not go to my actual childhood home would taint the whole experience. Despite my better judgement I woke up on Saturday and decided to drive the MassPike back to my home to catch up with friends and the remaining family I have on the East Coast. Driving the 83.8 Miles (I googled it) seemed like torture as I was nervous about ruining the last memories I had in my sleepy little town before the big move to the “LoneStar State” but thankfully all my worry was for not. 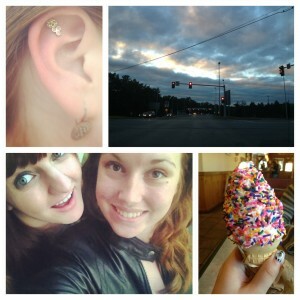 My day home- Family, friends, adventures, and ice cream. When I arrived back home in Southwick ( population >10,000) everything felt normal as I drove through the familiar streets and actually waved at people who recognized my little red car and the tall redhead that drives it. I arrived at my friends house and quickly we fell into old habits and caught up on everything that happened in the four months in which we did not see each other. After getting an impromptu ear piercing together and adventuring around Northampton, MA it was time to say good bye for another four months. I took solace in the fact that I realized I can go back home- although my house technically is now in Texas. When talking with friends and family I finally realized that where your mail gets sent is not necessarily where you have to call home. This past weekend home took on the meaning of that place where you feel most comfortable in familiar memories, the place where you know the back roads (and where cops hide for speed traps), it is the place where life feels most complete. I may now live in Texas when I am not at school but as cliched as it sounds- home is where the heart is and now I know that my heart still resides in Southwick, Massachusetts.